So there I was yesterday, riding my bike home through some neighborhoods that I have rarely, if ever, visited before. The ride itself was routine: one eye on the cars to my right, alert for the sudden opening of a door, the other eye monitoring my left flank, where cars were passing with an uncomfortably small margin or error. With both of my eyes thus occupied, you might not think that I would be able to see anything in front of me, but our brains are miraculous sensory processing machines, sorting, filtering and combining vast amounts of data into a surprisingly reliable guide to our immediate environment. So I saw her well before I actually reached her: her graceful curves, her open, welcoming mien, her smooth, unblemished face. I was so overwhelmed by her beauty that I literally stopped short, too awed at first to approach. As I stood there agape, my left foot still on its pedal and my right foot grounded, as if to steady my fluttering heart, I sensed—no, I knew, knew to the very core of my mitochondrial DNA—that she was waiting for me. Indeed, I’m not normally one to spew a lot of new age nonsense about kismet and cosmic master plans, but I could tell immediately that the universe had placed her there in anticipation of my arrival, and that she was eager to take me in her embrace, to have me and to hold me, to selflessly help me attain my goals. I tend to be such a pessimist that I figure it’s easier to deal with our streets as they are and fight with drivers for territory than to hope for major redesigns of our streets that would reduce car traffic and dangerous speeding, and encourage bicycling. So I’ll admit that I generally just suffer (and occasionally rant a bit) instead of taking part in the pro-bicycling advocacy that we have so much of around here, but you get a sense of what the world could actually be like when you see the above bike lanes (lanes! plural! three of them!) in Alameda, or the ped-and bike-friendly street redesigns that are popping up all over Manhattan. (My reaction to the 9th Avenue bike lane when I first saw it last year was similar to my reaction to the bike lanes shown above, and I did take some pictures, but the photos at this must-read SF Streetsblog post are a lot better). The fact is that it shouldn’t be so hard to remove a car lane and install a protected bike lane on a few well-chosen routes across all of our cities—all it takes is a few city officials who adopt this as a pet cause, and a small group of highly motivated citizens who work to mobilize support among the public, help come up with smart plans, and prod our cities to keep their promises. So maybe I’ll finally get down off my high bike and show up to one of the many meetings where people are working on the nuts and bolts of implementing these sorts of plans. If the last depression produced a legacy of bridges, parks and buildings which still enrich our lives 75 years later, why can’t this depression produce a legacy of bike paths, bike lanes and improved streetscapes that will enrich our own children, grandchildren, great-grandchildren and beyond? Maybe that’s too much to hope for, but when one is feeling the excitement of new love, almost anything seems possible. This entry was posted on Friday, April 3rd, 2009 at 1:47 pm	and is filed under Bicycling, Urbanism. You can follow any responses to this entry through the RSS 2.0 feed. You can skip to the end and leave a response. Pinging is currently not allowed. So, um… why do you need multiple bike lanes going the same direction on the same street? Wouldn’t a better use of the money have been to add a bike lane to another street instead of multiple lanes on this street? Mike: I did wonder that myself, but better too many bike lanes than too few, in my opinion. I don’t know for sure, but here’s my theory: There is a school nearby (behind the park on the right side of the photo) so I would guess that in addition to encouraging cycling, the city wanted to slow traffic in that area by reducing the number of car lanes. Once you decide to eliminate that car lane, your options are to build some kind of barrier to keep cars out of it, build a larger median strip, or simply paint over that lane with diagonal lines or a bike lane. Given those options, adding the third bike lane was one of the least expensive ways to go. 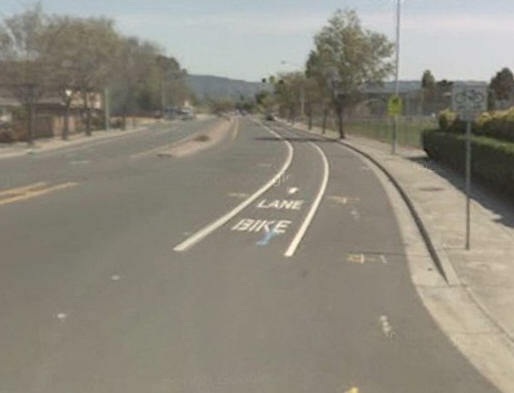 I suppose that cyclists who are making left turns along that stretch of road might use the left-most bike lane, but it does seem extraneous, and I assume they wouldn’t have added a third lane unless they wanted to reduce the number of car lanes for unrelated reasons. If you look closely, you can see another single-track bike lane adjacent to the car lane on the other side of the street. Excessive? Maybe, but if kids are walking across that street to get to school, 2 lanes of car traffic are a lot safer than 4. My impression from these posts is that Alameda is ahead of the game in terms of traffic and neighborhood planning. Does this seem true when you’re living there? When we were last in Hannover (Germany) in 2002 there were a lot of bike lanes, but these were part of the sidewalk. There was no sign to indicate that that strip of flagstone adjacent to the gutter was meant for bicycles. I guess the natives knew what these stips were intended for. As for visitors like me, we noticed when the bikes whizzed by us, sometimes rather too close. I don’t know whether this is true of other cities in Germany also. what intersection is this near? ng: I see where you could get that impression, since I’ve highlighted some good aspects of Alameda’s street design and some bad aspects of Oakland’s. That’s probably not entirely fair to Oakland, however. 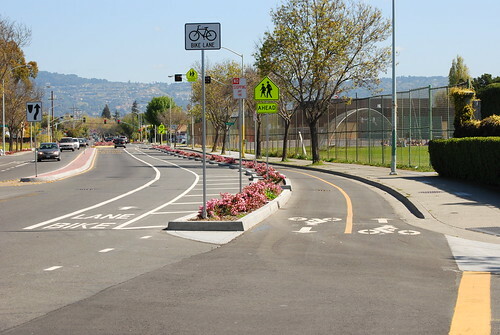 While Oakland is still very car-oriented, there has been some progress here too, including new bike lanes and bike racks, more pedestrian-friendly street designs and crosswalks, etc. Construction crews are currently working along Lakeshore Avenue, and the plan is to expand the park next to Lake Merritt, block Lakeshore Ave. at one end so it’s not a through street, reduce car lanes 4 to 2, and add bike lanes. That’s as ambitious as anything I’ve come across in Alameda, although it is taking years for the work to get done. If Alameda is “ahead of the game,” it is probably in implementation rather than planning. Oakland has an impressive “pedestrian master plan” and “bicycle master plan,” but when it comes to actually getting anything done, Oakland’s government is dysfunctional, its bureaucracy is mismanaged, and its finances are a disaster. I don’t follow Alameda politics at all, but just from spending time there, it seems to be run pretty smoothly and effectively (they clean the sidewalks, they enforce traffic laws, they fix potholes, and so on). I’m sure a lot of the difference comes from Alameda being a smaller city, and a city without Oakland’s resource-draining social problems, but the contrast can be pretty stark when you go back and forth between the two. Ruth: That’s interesting. As you say, the residents of Hannover are probably used to that arrangement, so it doesn’t faze them at all. There’s actually a school of thought known as Shared Space which says, counterintuitively, that it is actually safer on small streets in urban centers to allow bikes and pedestrians, and even cars, to share one undivided surface instead of separating them onto different lanes or levels. The theory is that if you make people share the space, it forces everyone to pay closer attention, take responsibility for their behavior, and to use more care as they negotiate their way down the road. Giving cars their own lanes, and bicycles their own lanes, and pedestrians their own area, is basically like giving everyone permission to be oblivious to their surroundings, and ends up being less safe for everyone. Peter: That photo was taken at the intersection of Fernside Boulevard and Washington Court, looking east on Fernside toward Lincoln Middle School. That spot is about a block or two east of where Fernside meets Otis Drive and the bridge to Bay Farm Island, at the southeastern end of Alameda. Wow! Beautiful. I think your theory about wanting to slow traffic and allow for left turns etc. must be right. I wonder also if there used to be parking on that road, and if they also wanted to get rid of the free parking (I never read that guy’s book about how free parking is one of the great evil incentives of our time, but it sounded good). Ruth and ng, did you know that Beacon Street, as originally designed (by Olmstead?) and built, used to have bike lanes? Those lanes were, according to the display in the CC library, removed to make room for curbside parking. Now, many decades later, there are again bike lanes, if only the lowliest kind. Interesting about Beacon Street! Now if they’d only follow Alameda’s lead (isn’t California supposed to be the trend setter) and reduce Beacon to just one lane for cars! It’s the permission to park on Beacon St that is inexplicable. However, they have used at least three parking spaces adjacent to Beacon St to build condos and a hotel on, and there was a time when the town discussed building a hotel on the parking space that still exists behind the arcade. The theory of drivers, bikers and walkers being more careful in “shared space” sounds utopian. In the situation in Germany, the opposite happened: bikers simply did not care if you were walking on their strip and acted accordingly. It was your fault: You were supposed to know the rules. I liked your description on “seeing a lovable bike lane”! Ruth: The Hannover situation doesn’t sound like a true shared space, since the pedestrian area and the bike lane were distinct. For the shared space theory to really be tested, you would need a space with no divisions at all, including differently colored surfaces. Once you divide the space into a “walking lane” and a “biking lane,” then people will inevitably get territorial about “their” lane. The only widespread examples of shared spaces that I can think of in the US are a lot of college campuses, where cyclists and pedestrians really do share the paths and plazas. There are a few reckless bikers here and there, and pedestrians who aren’t used to being around bikes sometimes get nervous, but for the most part sharing those spaces on campuses seems to work very well, in my experience. Bikes slow down to negotiate their way through the pedestrians, and pedestrians get used to having cyclists in their midst. And people watch where they are going for once in their lives! How about cellphone-only lanes, for pedestrians, cyclists, and drivers (SUV’s preferred) who are also on the phone? 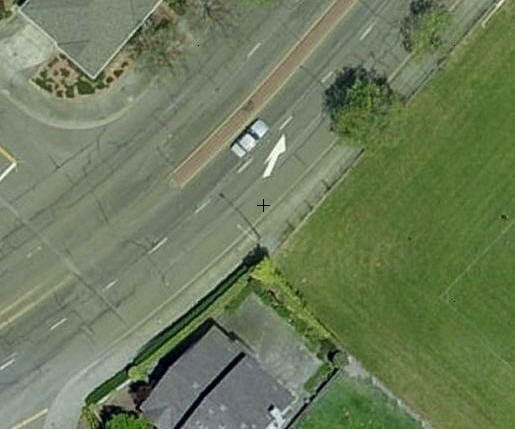 I think the main reason for both on one side like that (this is ignoring the standard, in-street lane) is that the protected lane also runs directly to the Bay Farm Island Bridge bike/pedestrian bridge, which is on the same side of the road. There seems to have (miraculously?) been some forethought and the planners decided to: 1) make it easier for the kids at the school to use the lanes; 2) make it easier for cyclists to get between the BFI bridge and the High Street bridge (part of my afternoon commute, actually); and 3) limit the number of crossings needed on a major road. Richard, this is a great question! I asked sreaevl people in the planning office why East Ave didn’t get striped as a part of this project. All I got were shrugs. It will take an enormous amount of citizen involvement and activism to get things like this done. For example, Rochester Cycling Alliance is working with the City to develop a bike master plan as we speak. Reconnect Rochester and RRCDC are pushing for a comprehensive transportation plan. Krudco (yes Krudco) raised millions of dollars and is working with the City to plan and build a skateboard park near along the river. These are all things that would simply not happen if it weren’t for regular citizens stepping up to help produce change. It’s not up to the City—it’s up to us!